Apple Vale Alpacas: Hippy New Year! Here's hoping everyone has had an enjoyable festive period. 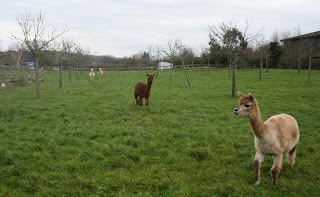 Once we were left 'empty-nesters' again after Christmas, we gave the periodical Vitamin ADE injections, and then yesterday, we walked our four halter-trained alpacas, two at a time, a quarter of a mile through the village to a lush orchard for new grazing. Camelot has stayed behind for halter training, with his mum and Moira, which began today. Further to previous blog - Barbara, you may be delighted to hear that Santa brought me a string of solar-powered l.e.d's, which I've strung through the shelter - post-Christmas it's like a fairy grotto/hippy den! Moira enhanced her thin coat, with an idea from the Worzel Gummidge collection. Meanwhile, it's fun looking forward to the show schedule, conferences, training days, birthing 'schedule', new grass, longer days, and I'm updating up the administration while I've a bit of holiday left. Best wishes for a happy, healthy, safe, satisfying and prosperous year. Glad Santa was kind to you Dave! Happy New Year, and happy new web site!. Looks great, and the video looks very professional, the spin course looks very tempting, sadly too far away from North Yorkshire.